Here's how to manage that setup. For the purposes of this example we're going to assume these are two different sales teams managing the same type of lead in two different markets. Lead types are like sub accounts within your account. Each lead type has it's own lead sources, team and lead routing settings. Read more about ways to use lead types. For our purposes we're going to create multiple lead types for different sales territories. Here's a complete write up on [creating and managing lead types](Read more about ways to use lead types. Click on lead types under settings. Click 'Add Lead Type' in the top right corner. Name the lead type and save it. Select team members to have access to the lead type. 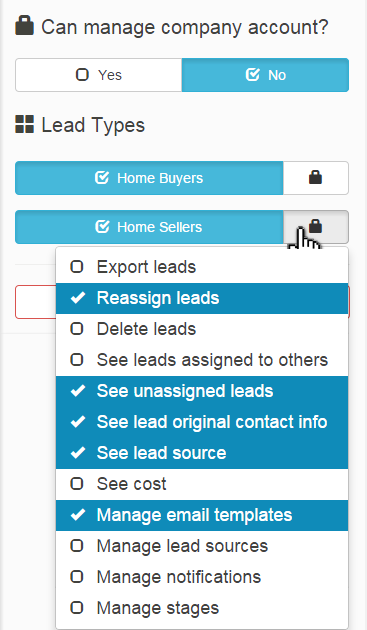 Go to the lead sources page under settings and create new lead sources for this lead type. Make sure you are editing the right lead type. You should see the name of the lead type at the top of the page. Go to the 'Notifications & Routing' page under settings and select who you want notified when new leads come in for this territory. Check out the complete guide to managing user permissions. Each user can have access to one or more lead types. You can control which lead types they are able to view by updating the settings on their users page. You can modify permissions for each lead type, for each user so that if Agent A is on multiple teams you can have granular control over what level of control they have for each lead type.